Don’t forget to sterilize your pruning tools to reduce the risk of spreading disease! DISCOUNTED 5-card gift cards sets are now available via our Etsy Shop! Order our 5-card Frog Gift Card set for just $20, plus taxes & shipping. Updated 4/3/2018: We’ve just added 3, 5-card gift sets in our Etsy Shop. For the price of 4 individual cards, you’ll receive a full set of 5 cards. 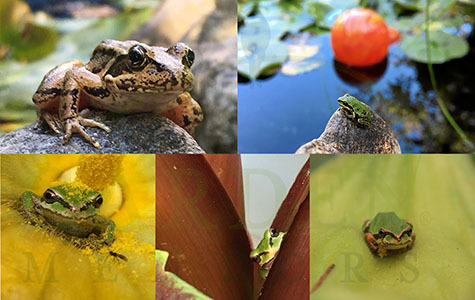 Choose from 3 curated sets: one that offers 5 frog photos, another features flowers & bay photos & the third shows off insects & birds. Choose one or order them all today! While supplies last, we’ll include a free set of stickers too. Lately I’ve become obsessed with the free Audubon birding app. I’ve had it installed for a while and until recently only used it occasionally, and I only used a few of its features. 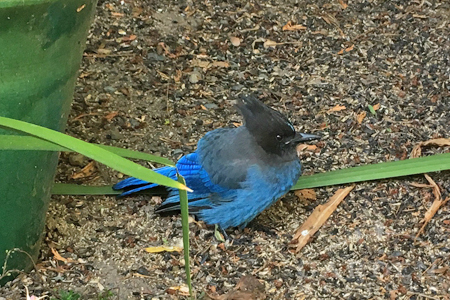 Steller’s Jays are gorgeous, if a bit obnoxious. This one may have been injured or may have just been hiding from the hawk that was screaming nearby. Now that I live near a protected estuary, open fields and mixed forest, I have a lot of bird neighbors. On even the dullest birding day, I’ll awake to hummingbirds sipping fuchsia and salvia nectar just out my bedroom window. I’ll see falcons and vultures soaring on the thermals overhead. Bald eagles swoop from above as I gather blackberries for happy hour. Various hawks scream from the field just beyond our west wood. Swallows flock in at dusk to nosh on gnat hatches. Woodpeckers, jays, sparrows, chickadees, bushtits, nuthatches and cedar waxwings are a few of the regular visitors to a feeding station outside our kitchen window. And, often I’ll even scare up a great blue heron feasting on frogs in one of our ponds. All of that without even walking to the Padilla Bay shore trail where the list of birds expands far beyond my meager birding id skills. The Audubon Bird App comes in handy whether I’m trying to lure a curious downy woodpecker just a little closer or figure out which of the many sandpipers I’m seeing at the shore. Its many features help me identify and locate birds in my area, create a list of my sightings, learn about birding and bird photography and share with the greater birding community. Let’s say I see a woodpecker at my feeder, but I’m not sure which kind it is. I can use the “explore birds” function to search by the word “woodpecker” or by a shape or family. This tool will bring up images, descriptions and even audio snippets of the birds themselves. Unfortunately, it doesn’t share much about a bird’s diet, which would really come in handy for filling the bird feeders. 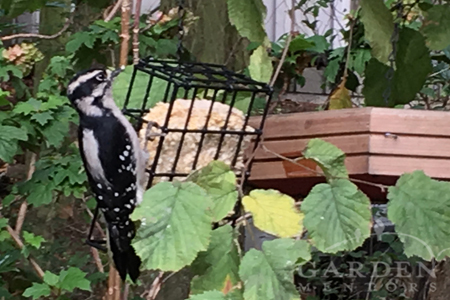 The Audubon app helped me determine that this is probably a female downy woodpecker. So, once I pull up the woodpecker I’m looking for and begin playing the audio clips, I can use that to lure birds closer. Almost every bird I’ve tried this on has responded. A red-breasted nuthatch was so intrigued it almost landed on my hand! 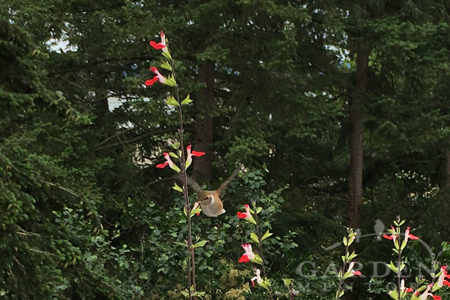 During the breeding season, migrating rufous hummingbirds are abundant in our garden. These little bullies do battle with our year ’round resident Anna’s hummingbirds. Too, I can share geographical information about my sighting, which I have to imagine may help the larger birding community see migration habits as they change over time. If I’m so inclined, I can turn on location sharing to set my location, or I can share sighting areas manually. And, it’s easy to then quickly post the same image into Twitter or Facebook directly from the Audubon App; unfortunately, it doesn’t seem to connect to business pages or Instagram, but hopefully that’ll come soon. If you have any interest in birding and have any room for another app on your smartphone or tablet, go get this birding app today. It’s available for iOS and Android. And it’s free for everyone. But do us all a favor and use that “donate to Audubon” feature in the app once you download it and fall in love. Have you ever had to rescue a hummingbird? This week a couple of our many hummingbirds decided that our open front door was an invitation to explore inside. They’ve been darting about just outside the door for weeks now, feeding on blooming Acanthus, Fuchsia and other tasty nectar sources. 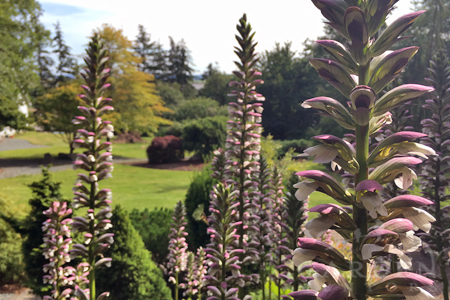 Blooming Acanthus is a hummingbird favorite in summer! And, based on flight behavior and the chirping I know Annas do as they approach their nests, it’s likely there’s a nest not far from the door too — high in a Serbian spruce. So, it wasn’t terribly surprising that one would make their way into the house. Still, it was quite a worrisome moment. Never have I touched a hummingbird, let alone rescued one! So, what happens when a hummingbird comes inside? 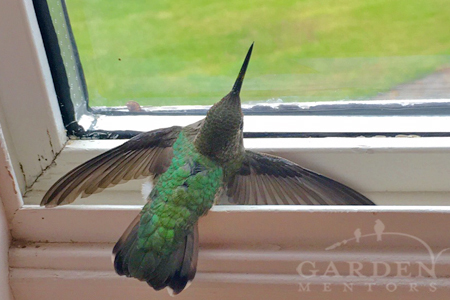 This hummingbird looks injured, but really she’s just a bit shocked to have met with a window – surprise! Well, this pair both flew straight for our large windows, which stopped them in their tracks. And, whether they were stunned by the impact or simply surprised, both froze with wings expanded into a corner of the windows. The contractor working on our house gently gathered up the first and released it into the air outside. I followed, carefully lifting the tiny bird and cupping her in the palm of my hand. She was awake but remained frozen, likely playing possum. In fact when I opened my fingers wide outside the door, she would neither fly away nor latch onto the Acanthus in front of her. So I delicately set her inert body on the soil of a hanging planter, high above the ground where predators probably wouldn’t reach her. Yet, she still didn’t move. Thinking this might be an interesting photo opportunity, I grabbed my nearby phone, began to focus it near her, and bzzzzt! she was gone. Want to learn more about living and gardening with hummingbirds? Join me on Saturday, June 25, 2016 at Swanson’s Nursery in Seattle for a free seminar at 10am. Seating is limited, so be sure to arrive early! Putting together our simple DIY bird feeder recipe that follows is a fun family project, especially in winter when bird forage is scarce, days are short and the weather is rough. This chickadee hopped from branch to branch, within arm’s reach, as I hung feeders. S/he could hardly wait! If you’re participating in your local Christmas Bird Count from home, start hanging feeders well before your count day to lure in a large bird population. Once they know yours is a tasty rest stop, they’ll be dropping by often! 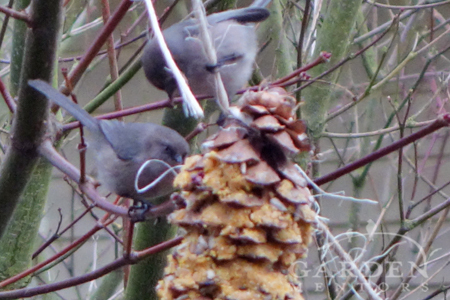 Bushtits love peanut-butter laden cone feeders almost as much as they crave suet. We like to forage for pine cones rather than buy them. However, if you don’t have a foraging option, be sure that any you purchase haven’t been treated. If you have access to big sugar pine cones, consider yourself lucky. On our foraging foray, the best cache of cones we found were from a white pine. They work, but not nearly as well as those big, hard cones other pines produce. 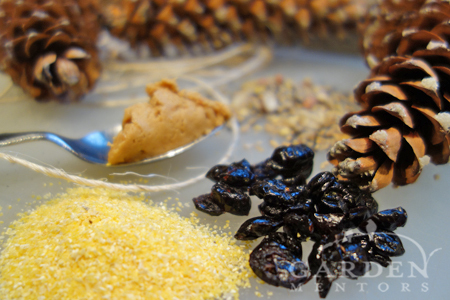 With just a few simple ingredients, you’ll be all set for a fun crafty day making bird feeders. From one end of your jute twine, measure about one foot. 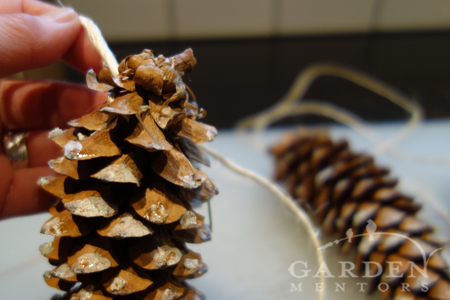 At that marker, loop the twine firmly around the branch end of your first pine cone and tie it off. Take care not to loop and tie it so tightly you snap the end off your cone. Do not cut the twine. Measure another length of about a foot and repeat tying your next cone into place. Repeat for as many cones as you wish to have on your garland. Be sure you leave plenty of extra on each end so you can tie the string onto your trees outside. Biodegradable jute twine makes a great tie for your feeder. Be sure to loop it a few times around the branch-end of your cone & tie it or the cone may fall off. In a large bowl mush up the peanut butter. Then, begin working in the cornmeal a couple of tablespoons at a time. If your peanut butter is very dry, it will absorb less cornmeal. The cheaper cornmeal will make the more expensive peanut butter go further, but you don’t want it so dry it won’t stick in your cones. Once the mixture is still quite goopy, stir in the seeds and any berries. If your mixture becomes dry, add in more peanut butter. Using your hands, squish your mixture into the gaps between the cone scales. Yes, it will be messy! And, be prepared to get some cone sap on your hands. Don’t worry if you aren’t able to fill all the gaps, we usually aim for the middle and call it good. The birds don’t care! 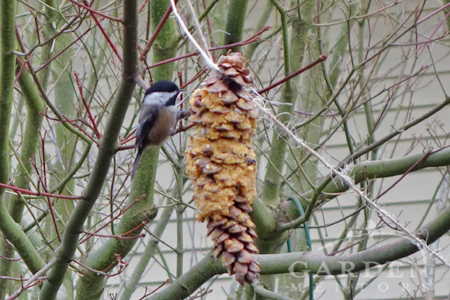 Laden with food, this pine cone bird feeder will feed a flock! Gather your cone garland into your mixing bowl to take outside. Choose one of the ends of the garland to tie to a branch. We usually leave a loop so it’s easy to remove and refill later. Then, loop each cone that follows on the garland onto nearby branches. 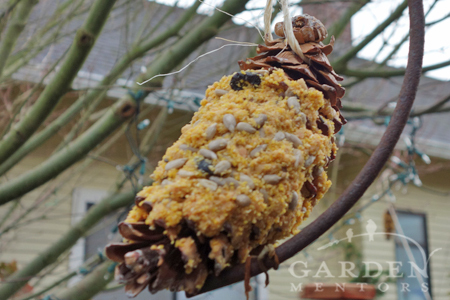 Tie off the final length of twine to secure your DIY bird feeder garland into place. Grab your binoculars or camera. Stand in your favorite viewing spot, very still, and get ready for some birding fun! Learning how to attract bumblebees goes beyond planting a few summer blooming plants and hoping for the best. Certainly adding in their favorite forage invites bees to your garden, especially if you offer plants that flower from very early spring through late autumn. But, there are a few other things you can do the create a garden habitat that attracts bumblebees. 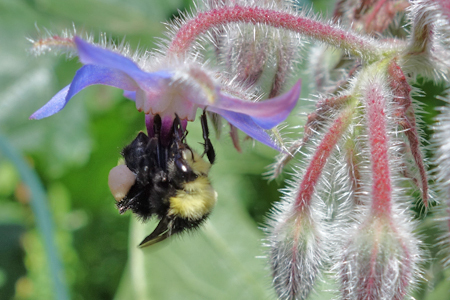 Like honeybees, bumblebees adore borage! Plant it by tomatoes for extra pollination power. In years past we’ve adopted bumblebees that others chose to have removed from their garden. Removing bees happens. Sometimes having bees in an urban garden location just isn’t the right thing for some folks. For us, we’re always signing up with beekeepers to take in bumbling, buzzing waifs. And, we strive to leave some areas of our garden undisturbed in hopes that wild queen Bombus will create her palace in a quite portion of our garden. 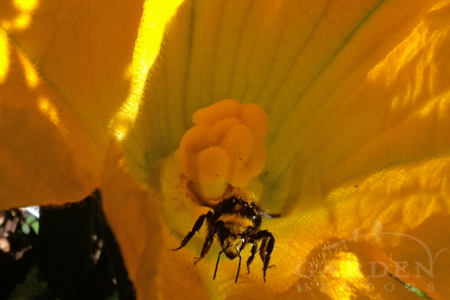 Different bumblebees forage actively at different times of year & on different types of plants. Some have longer tongues than others; some pollinate by buzzing inside flowers. Notice this bumbler’s red tongue as it forages in an asparagus flower – nom-nom! Sign up with a local beekeeper who does poison-free extractions and offers to re-home any intact bumblebee nests. Create undisturbed bumblebee friendly areas on your property. Okay, so there’s one more that seems pretty obvious: lay off the ‘cides in your garden. 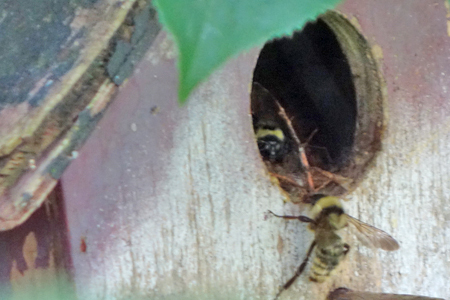 Want queen Bombus to nest in your garden? Don’t clean up your garden floor ’til every inch looks tidy for the growing season. Yup! Embrace your inner sloth and don’t rake up all that leaf duff that fell last fall and overwintered. Sure, a few slugs may live in there, but so do overwintering queen bees, beetles and other beneficial garden life. 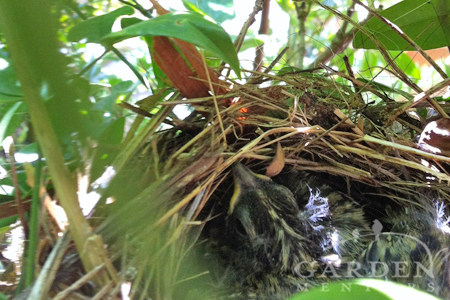 Don’t remove abandoned bird nests. Queen bee loves to snuggle her brood into these cozy cradles of twigs and fluff. Left in place this year’s sparrow nest may become next year’s bumblebee nest. Don’t clean out your bird houses. These are some of the fuzzy, buzzy queen’s favorite abodes. A few years back when our friend Dan The Bee Man brought us a bumblebee colony, he’d been able to extract the nest intact because they were living in an old bird house. (If the bees had been nesting in the ground, he probably wouldn’t have been able to extract them without destroying the nest.) The following year, we relocated the birdhouse to a protected spot off the ground, and wrens moved in that spring, but no bumblebees. This year, a new Bombus family has moved into the house again — just a few feet away from several squash plants and our largest patch of tomatoes, which are primarily pollinated by bumblebees. What we believe to be Bombus fervidus* have created a nest in an abandoned bird house in our garden. This is the same bumblebee-friendly house we gained in 2013 thru adoption! We like to think we’re in for a bumble-crop this summer! Don’t forget to get your free copy of our Pollinator Favorite Things so you too can grow a garden bees and other pollinators can’t resist! 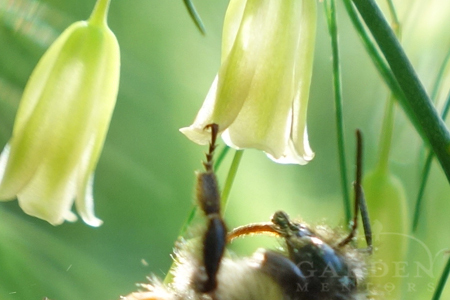 *We’ve done our best to identify which species of Bombus is shown in this post using BumbleBee Guide to West produced by folks who know more than we do about this amazing genus of bees. If we misidentified any of them or if you know more, please share what you know in the comments below. We’re always eager to expand our knowledge! In fact, we’ve submitted several photos of our nesting bumblebees to the Bumble Bee Watch program and are hopeful we will receive identification verification soon (Updated July 24, 2015: our sighting has been verified as Bombus fervidus via the Bumblebee Watch program here).